Sometimes being part of the family business means working for Mom. Hers is the first heartbeat you hear, the voice in your head reminding you to eat your vegetables, the hug you need when life is not on your side. You can count on Mom to love you, feed you, and cheer you on. That’s what mothers do for their children. But what if Mom is your boss or your coworker? These four families share a little about what it’s like when being part of the family business means working with Mom. When your family has been in the same business for more than 80 years, it starts to become part of your nature. So it’s no surprise that both Patty Artis and her daughter Beth are interior designers; Patty’s husband, Beth’s father, is descended from C.J. Artis, founder of the original Artis Furniture Company in Des Moines. For the Artis women, working with family is just part of life. The mother-daughter duo has worked together for years, as well as pursuing work independently, which has helped them grow as designers and as a company. Whether it’s generational or personal preference, Patty believes Beth is more comfortable and more talented with the techy side of the business, so she leaves her in charge of things like the newsletter and the website updating, as well as CADD work for design/build projects. Patty and Beth have worked together in various roles for more than two decades, reteaming again a few years ago after Patty went through a lengthy illness. That experience served to reinforce the already strong personal and working relationship the two shared. Situations like that only strengthen your bond. James Von Gillern was fairly young when his mom, Robin, entered the real estate field. James first thought about selling real estate around the time he finished high school. He earned his realtor’s license as a freshman in college. “I liked the flexibility it offered, you could be your own boss and your success was determined by how hard you worked,” he says. When he expressed his interest in following her example, Robin encouraged James to take the classes for his real estate license. “Mom told me if I was going to do it, I needed to do it right and really learn the business,” he explains. Originally he worked in commercial real estate. But after a few years, he decided to move back to Iowa, and he chose to focus on residential property instead, like his mother. Today, both work from Coldwell Banker’s West Des Moines office, their desks side by side. 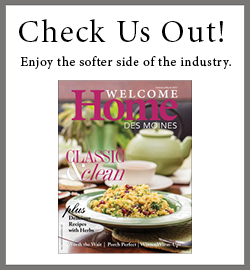 His past involvement with the Home Builders Association of Greater Des Moines also included serving as chairman for its annual HomeShowExpo a few years ago. Robin’s specialty, on the other hand, is re-sales and relocations, where her years in the business have resulted in a large referral base. One of the top real estate professionals in central Iowa, Robin has set a high standard for her son to follow—and he’s on his way to doing just that. Sarah Grant & Rachel Eubank of Sticks, Inc. When you grow up with an artist for a mother, joining the family business can be an intimidating prospect. Just ask Sarah Grant, founder of Sticks, and her daughter Rachel Eubank. “I had worked at Sticks part-time in high school. But I never really had any interest in being an artist,” Rachel says. So Rachel’s development into the chief operating officer at Sticks, the popular home furnishings and decor company based in Des Moines, came after an unexpected twist in her career path. Unbeknownst to her mother, Rachel was the top applicant when a position opened up for an events manager at Sticks. “Our HR manager showed me a résumé and said, ‘I have this wonderful, energized young woman I think would be great for the events management job.’ I said, ‘Hmm. I know her,’” Sarah remembers with a laugh. In the 12 years since Rachel joined the staff at Sticks, she’s learned all aspects of the business, from events to marketing to retail sales, and is now chief operating officer. This has enabled Sarah to step back from the day-to-day management of the company and focus on the artistic aspect, which was her first love. Sarah has no plans to retire, but she says she’s enjoying just getting out of Rachel’s way and seeing where the business goes. When Joe and Christy Aeschliman started Valley Pool & Hot Tubs in 1989, they knew they wanted a business that allowed them time with their young family. As it turned out, the family grew and the business just became a part of who they are. The Aeschlimans raised five boys while building their business, and every one of them learned the value of hard work alongside their parents. Valley Pool builds and services in-ground pools and hot tubs, provides pool maintenance services, and sells pool products at its West Des Moines location. More than 20 years after opening the company, four of the five Aeschliman boys continue to work for Valley Pool, and Christy runs the business with the help of an office staff that feels like an extension of the Aeschliman family. Mark, the youngest of the brothers, agrees. “We all grew up in the business, so everyone here is family,” he says. “We’re closer to each other because we work together every day,” Mark explains, which is high praise coming from low man on the totem pole. As the newbie in the crew, Mark is assigned to pool cleaning for the foreseeable future, not one of the glamor jobs. They may be working for the family business, but Mom doesn’t let any of the Aeschliman boys coast on the family name. “It’s great working outside, working with family and friends,” Mike says. But the brothers acknowledge, it’s real work, even when you’re not on the bottom run of the family ladder. But the pros of working with family far outweigh the cons, though, as all the Aeschlimans will attest. After Joe’s death in 2013, the presence of family on a daily basis became even more valued for all of the Aeschlimans. The entire, extended family lives nearby, including all seven of the grandchildren.